You will not be seeing this in 2012. The 2012 B1G primetime TV schedule has been released for general consumption [ESPN]. And consume we will. From the Michigan perspective, pretty much what we expected. No home night games this year, and the Nebraska road contest will kickoff in primetime. Also, the Purdue game on Oct. 6th will kickoff at 4PM, so not exactly "primetime" but late-afternoon. There was some glimmer of a chance that the Michigan-Michigan State game on October 20th could end up being a night game, but the prospect of the much needed added security for that event was enough to keep it from happening. No surprise there. 2012 Michigan schedule/results lives here. Anyway, here's the full B1G primetime slate. Michigan specific info via UM press release. ANN ARBOR, Mich. -- In addition to the previously announced primetime games against Alabama and Notre Dame, the University of Michigan football team announced Tuesday (April 24) in conjunction with the Big Ten Conference and its television partners the selection of two other late afternoon or primetime contests during the league slate. Michigan will play four of its six road games in late broadcast slots. Three contests will be played in primetime and the other will kick off in the late afternoon window. U-M will travel to West Lafayette, Ind., for a nationally televised game with Purdue starting at 4 p.m. EDT. The Oct. 6 game against the Boilermakers will be broadcast by the Big Ten Network. The Wolverines will make their initial trip to Lincoln, Neb., on Oct. 27. The game against the Cornhuskers will be shown in primetime on one of the ESPN platforms. The TV network for the 8 p.m. EDT kickoff will be selected at a later date. The only previous match-up with Nebraska at night came in the 2005 Alamo Bowl, a 32-28 victory by the Cornhuskers at the Alamodome on Dec. 28. 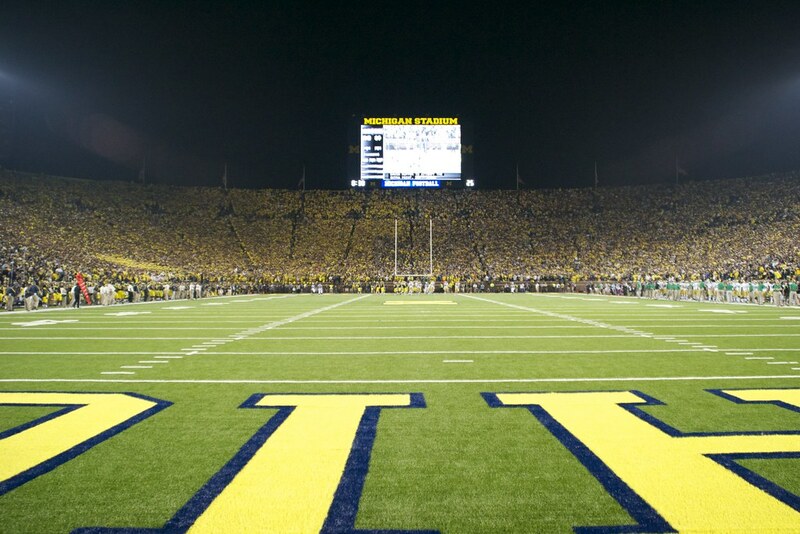 Michigan has compiled a 25-12 overall record in night games starting after 5 p.m. local time. The Wolverines posted a 3-0 record last season, defeating Notre Dame in the first-ever night game in Michigan Stadium history, winning at Northwestern, and posting an overtime victory against Virginia Tech in the 2012 Allstate Sugar Bowl.